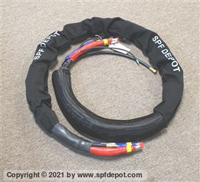 For a low pressure heated hose to run your foam spray gun, take a look at this 50' X 3/8", 2000 psi heated SPF hose. This spray foam heated hose is as tough as they come compared to anything else out there, plus we offer an upgrade by way of a rubber jacket to help scuff- and moisture-proof your hose. Low Pressure - 2000psi. Braided heater wire surrounds the hose and is encapsulated inside to prevent any moisture from contacting the heater braid. Heater braid provides an 85% coverage of the hose compared to 35% of the ribbon heater wire. PVC Protective Extruded Jacket, Heater and thermocouple wire, 3 pin connector, heater wire connecting block and fittings included. Scuff Jacket - Order 246077 Scuff Jacket. 50' lengths.